Ohio Swiss Cheese: Taste Tested Better than the Imports! 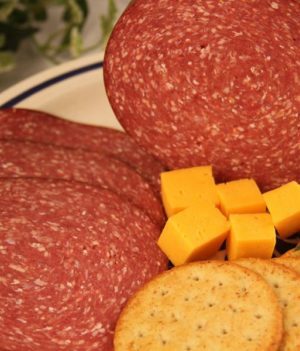 Ohio Swiss Cheese, or more specifically our Amish swiss cheese is made locally in Pearl Valley, Ohio. The time honored process for making swiss cheese was brough here from Switzerland by the local population of Amish and Mennonite people. 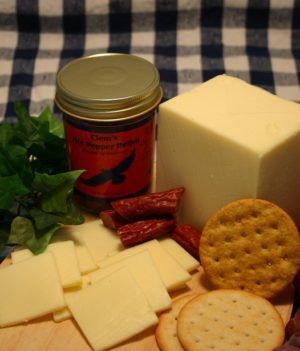 At Shisler’s we have selected what we believe to be the best locally made swiss cheese. 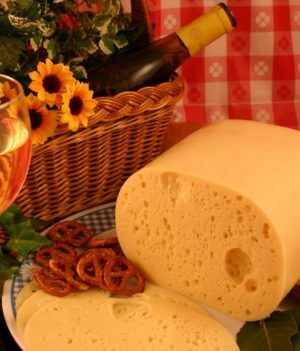 Our Swiss cheese can also make an excellent low cost substitute for Gruyere cheese. Our locally made Amish swiss cheese closely resembles the original Swiss Emmental Cheese, which was originally produced in the Swiss canton of Bern . 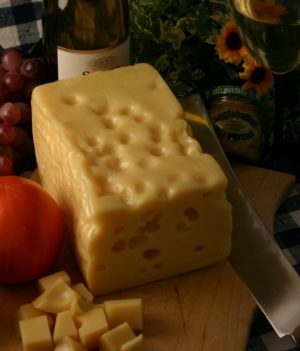 Local Swiss cheese has a distinctive appearance, as the blocks of the cheese are riddled with holes known as “eyes”. 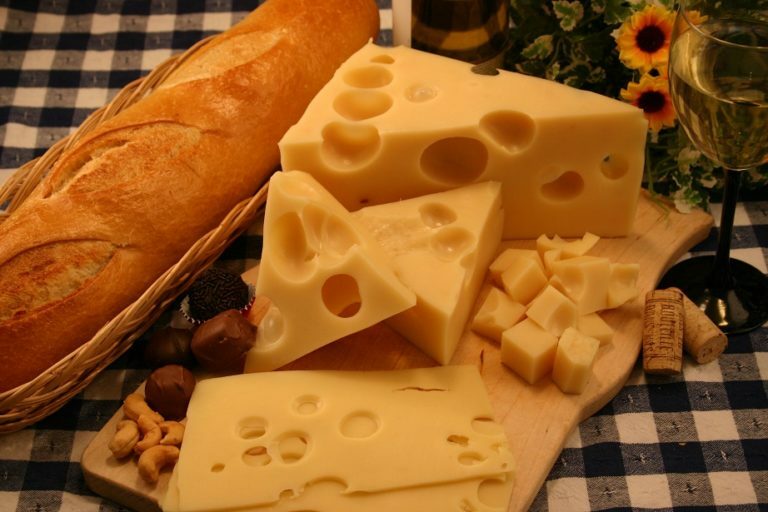 Swiss cheese is known for its nutty, bittersweet taste. What Causes Holes in Swiss Cheese? This is often debated, but generally the larger the eyes, the more pronounced the flavor of the cheese. 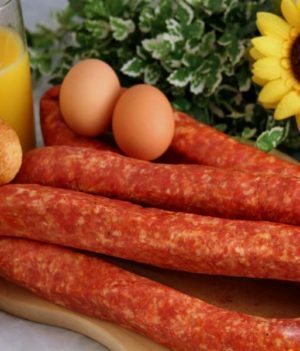 The reason for this is that the conditions that provide the ideal flavor, longer aging at higher temperatures, are also the ideal conditions for the enzymes and bacteria to create larger eyes. This poses a problem for makers of pre-sliced Swiss cheese. Cheese with large eyes doesn’t slice well, sometimes coming apart in mechanical slicers. 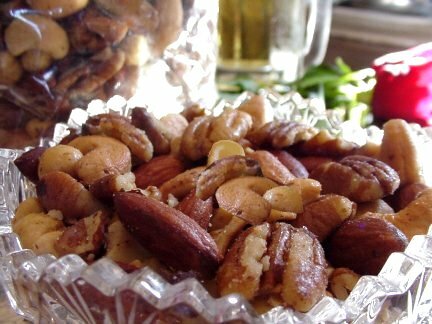 This costs time and money and is one reason why US manufacturers usually produce a product less aged and flavorful than the Amish swiss cheese made in Northeastern Ohio. 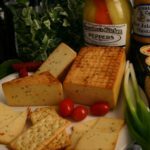 It is also essential that the milk used in making the cheese comes from specific types of cows that graze in specific grasses. All of those elements are present in Holmes County Ohio, and the milk is provided by local Amish farmers who do not give their cows hormones or antibiotics or add preservatives to the milk. 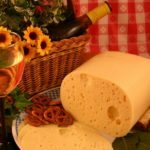 The result is a Swiss cheese that tastes as good, if not better than the original Emmentaler that is imported from Switzerland, at approximately 1/3 the price. Baby Swiss is another related cheese. Made by substituting water for the milk’s whey to slow bacterial action, Baby Swiss cheese has smaller holes and a milder flavor. Baby Swiss is made from whole milk. 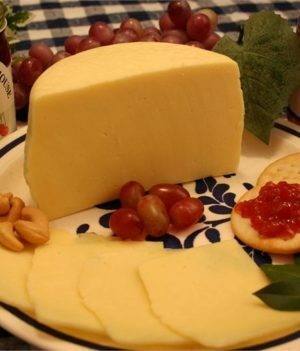 Lacy Swiss is a further variety of US small hole Swiss cheese made with low fat milk. 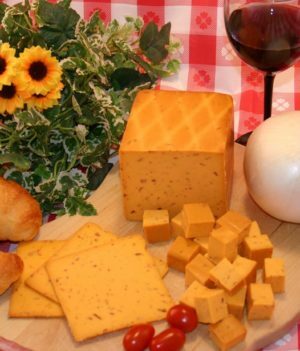 Ohio Swiss cheese pairs very well with numerous wines, but the most popular pairings are Cabernet Sauvignon and Merlot. Beaujolais and Pinot Noir are also great matches. 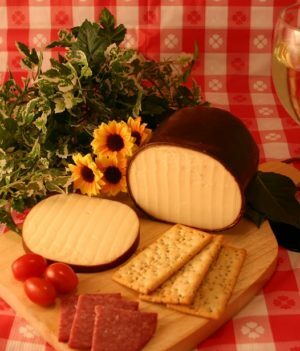 If you prefer white wine, Chardonnay, Riesling, and Sauvignon Blanc pair well with Ohio Swiss cheese. 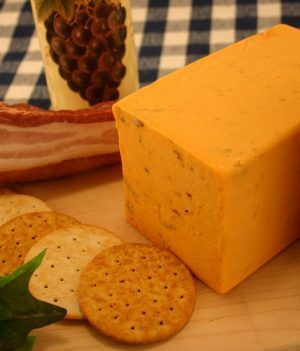 And for the beer lover, Ohio Swiss cheese goes well with Lager, Pale Ale, and Weiss Beer. 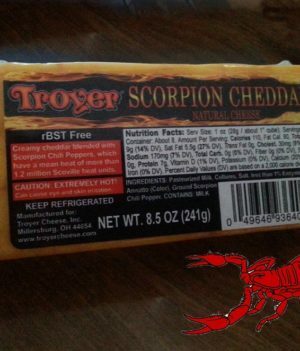 If you prefer imports, try our Gruyere Cheese.